A new study of the APAC region (including Australia) has revealed that 81 per cent of respondents agreed that fast food was contributing to obesity while 64 per cent said the fast food chains should do more in regards to public health. The study, by YouGov, polled over 9,000 from the Asia-Pacific and found that 95 per cent wanted wanted more measures to control obesity; however, that was tempered with a further 93 per cent agreeing they liked eating fast food. The most popular type of fast food in APAC is fried chicken, favoured by 34 per cent of those polled. Pizza and burgers also score highly, chosen by 28 per cent and 20 per cent of people respectively. Preference of fast food is the same across APAC except for Australia, Hong Kong and the Philippines, where people like pizza more than fried chicken. 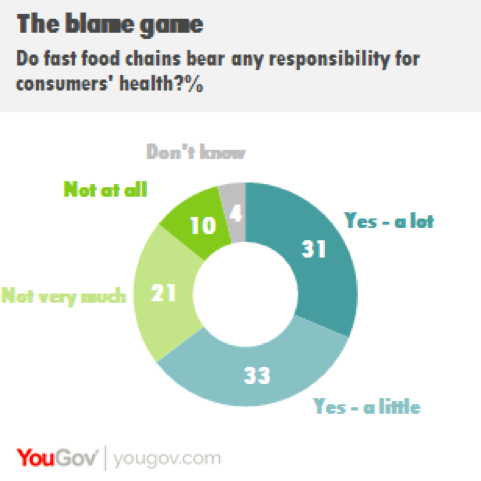 Asked about a range of possible measures to tackle obesity, the ideas that attract the broadest support are: to increase the number of low fat options available to consumers; to limit the amount of fat in foods that fast food chains are allowed to sell; and to make more information available about what is in fast food. Each of these proposals is supported by half of those polled in APAC (50 per cent). Other popular measures include forcing fast food companies to make mandatory contributions to the healthcare system (supported by 39 per cent of those polled); an increase in public/private partnerships to support healthy eating (supported by 38 per cent); and encouraging fast food companies to make voluntary contributions to the healthcare system (30 per cent). 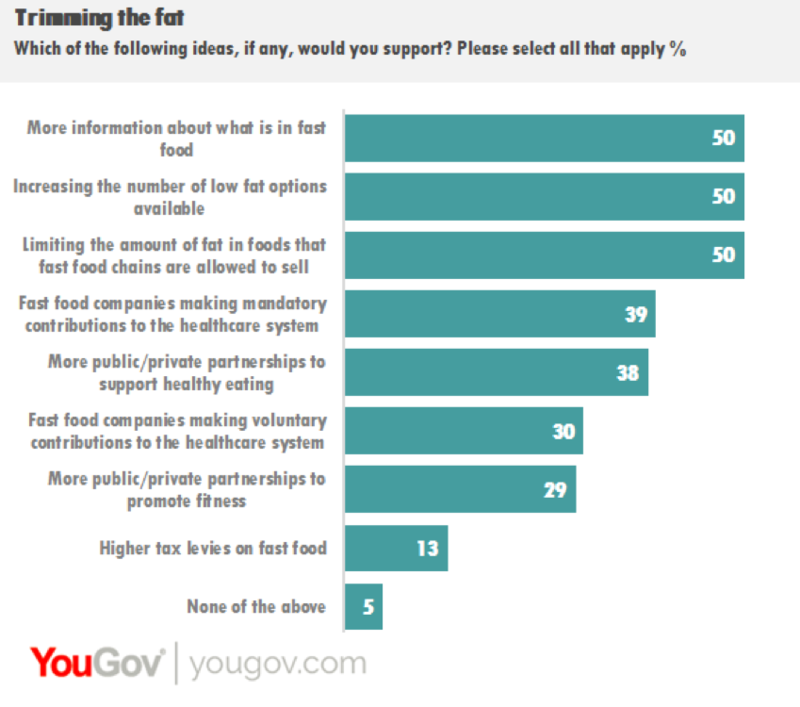 Overall, just five per cent of those polled would not like to see any of the above options introduced, indicating that there is widespread support for action on obesity.